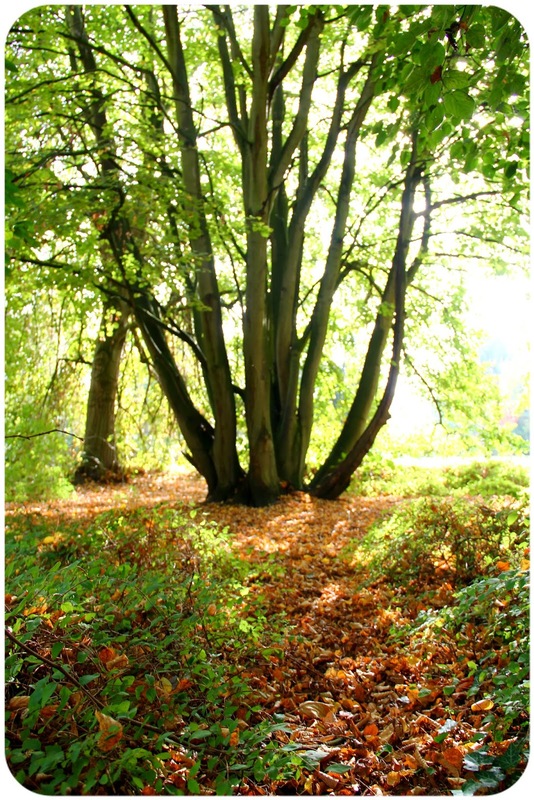 October is synonym with the first real days of Autumn. While September still has that summery ring to it, even the most sunny October day can no longer hide the fact that Summer is well and truly over. The sun is slowly but surely withdrawing her light and her warmth is waning. There's a certain melancholy in the air, gently tugging at one's heartstrings, while nature's final fireworks are trying their best to detract from the apparent decay. October means foggy mornings and the first hint of frost. It can no longer be denied that the days are getting shorter and now that we've once again put the clocks back one hour to herald the approaching Winter, darkness is upon us before the afternoon is over. Vivid shades of tangerine dye the sky as the sun rises or sets. 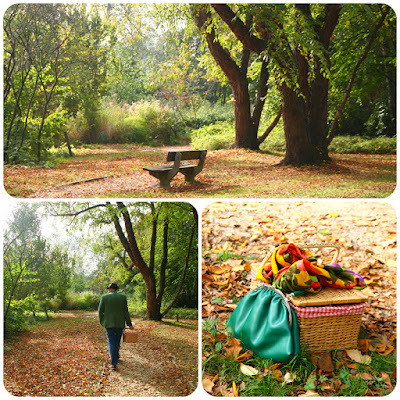 And everywhere, crunchy carpets of fallen leaves are getting satisfyingly kick-worthy. October always has a couple of treats up its sleeve, one of them being the Dag van de Kringwinkel (Day of the Charity Shops), a yearly event to promote the workings of the charity shops here in Belgium. This year, the event was on Saturday 20 October. In our local chain of shops, this means there's usually a lot of vintage on sale, things that have been hoarded throughout the months preceding the event and which are now being sold at inflated prices. Nevertheless, we still can't bring ourselves to give this day a miss, as there's often treasure to be found among the inevitable tat, and in spite of everything, there are still bargains to be had. Between shops, we stopped off at the park for what might well have been our last outdoor picnic of the year. The weather was still doing her Summer impression, but there was a slight chill in the air which warranted the wearing of some true Autumnal pieces. 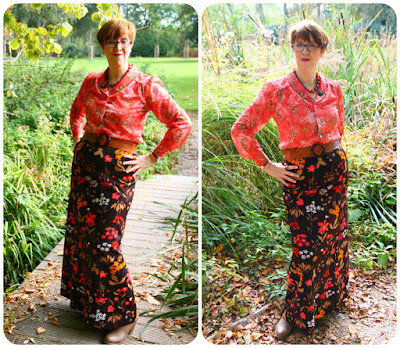 Could there be anything more Autumnal than this maxi skirt, in darkest brown, and sprinkled all over with ochre, red, pink, taupe and white flowers? It's handmade from a thick polyester fabric and lined to boot. Its previous owner must have been as vertically challenged as me, as it was just long enough for me not to trip over its hem. My jacket, in a bottle green velvet, was its perfect companion. The brooch I pinned to its lapel, its Lucite shell encasing a crinolined lady walking among flowers and wearing a summer hat, was a gift from the lovely Lynn. Isn't it absolutely gorgeous? The sun was playing with the amber and golden leaves, illuminating their vibrant shades, the sunlight shimmering through the treetops creating a slightly disconcerting feeling of timelessness. There's something quite mesmerizing about standing beneath a canopy of trees, looking up at the sunlight filtering through its tangle of branches and leaves. 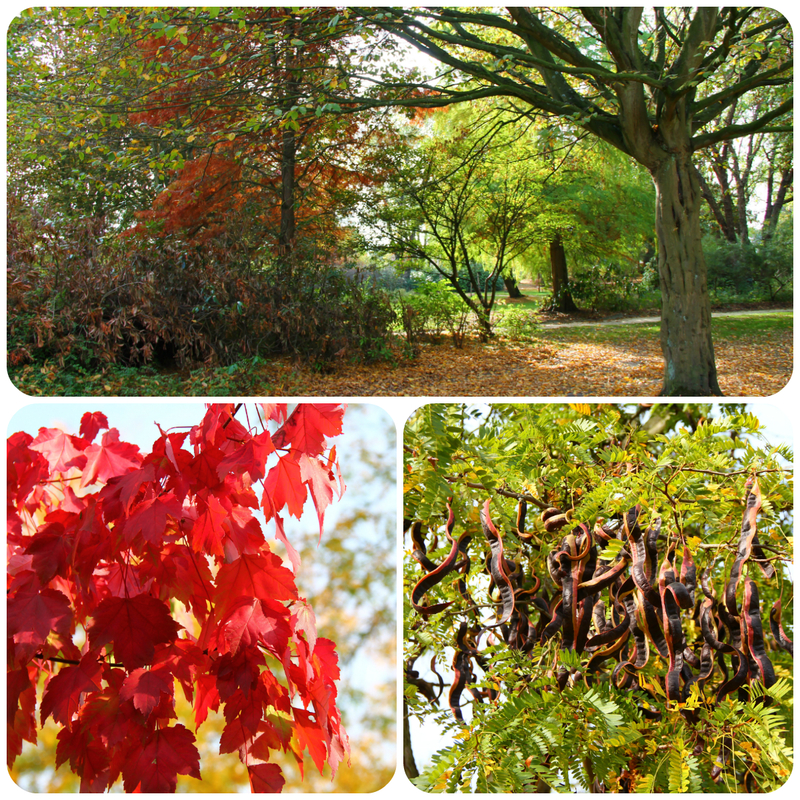 The small park here is always a delight, whatever the time of year, and we keep returning again and again to see the changes each season brings. 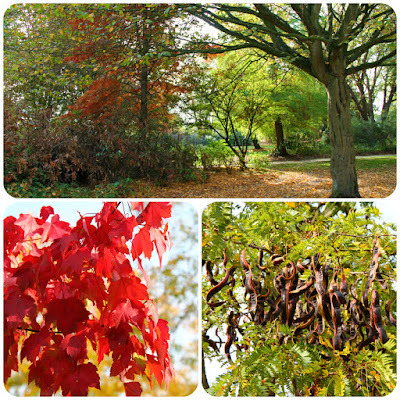 I love the vivid red of these leaves and the long curly seed pods of the Acacia tree, which will soon litter the ground and footpath beneath its overhanging branches with their alien shapes. There's no label to identify the contents or provenance of this almost sheer crepe like blouse in a colour I would call coral, and with a delicate flower print. My brooch, with its deep green stone, is another one from my flea market haul. When I shared it on Facebook, one of my friends commented that it would make me look like a superheroine. Well, I actually wouldn't mind having a superpower or two! Further accessories were a caramel belt with a round tortoiseshell buckle and amber coloured beaded necklace. There are hidden delights around every corner, and my camera's been working overtime, as my eyes dart here, there and everywhere trying to catch all these visual treats. Here I was taking out my smartphone to make a snapshot of the pretty pink cyclamen growing among the layer of leaves. But I mentioned charity shops, so I guess you'll be on tenterhooks to find out what I've found! 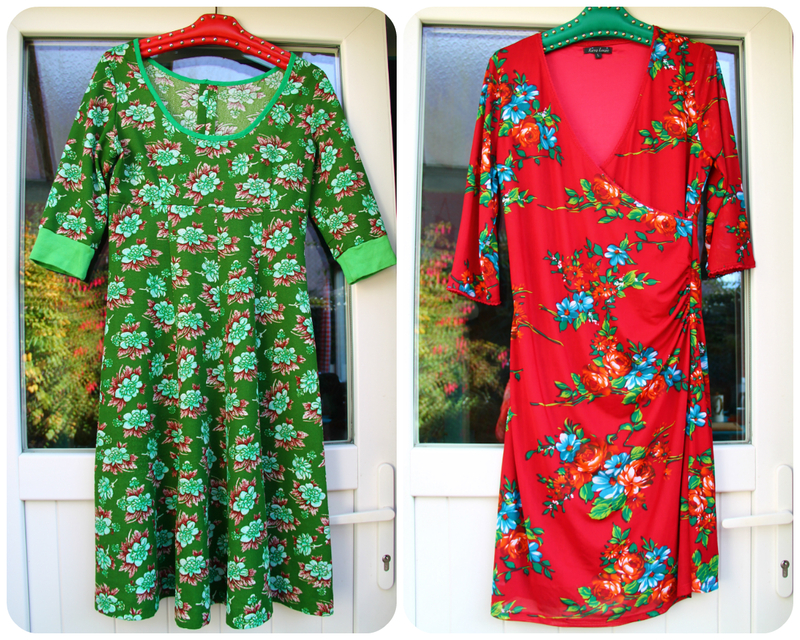 I can never resist a colourful print, so first up are these two retro print frocks. While the green one on the left looks to be handmade, the deep red one on the right is another King Louie dress, its original retail price a tenfold of what I've paid. I already wore this one to work later that week. Here you can have a closer look at the prints. Unworn Hush Puppies boots for € 4? Yes, please! The pattern of the Boch coffee pot on the top right is Argenteuil. Dating from the early 1970s, this is one of the patterns we collect, and we already own pieces of the coffee and dinner service. 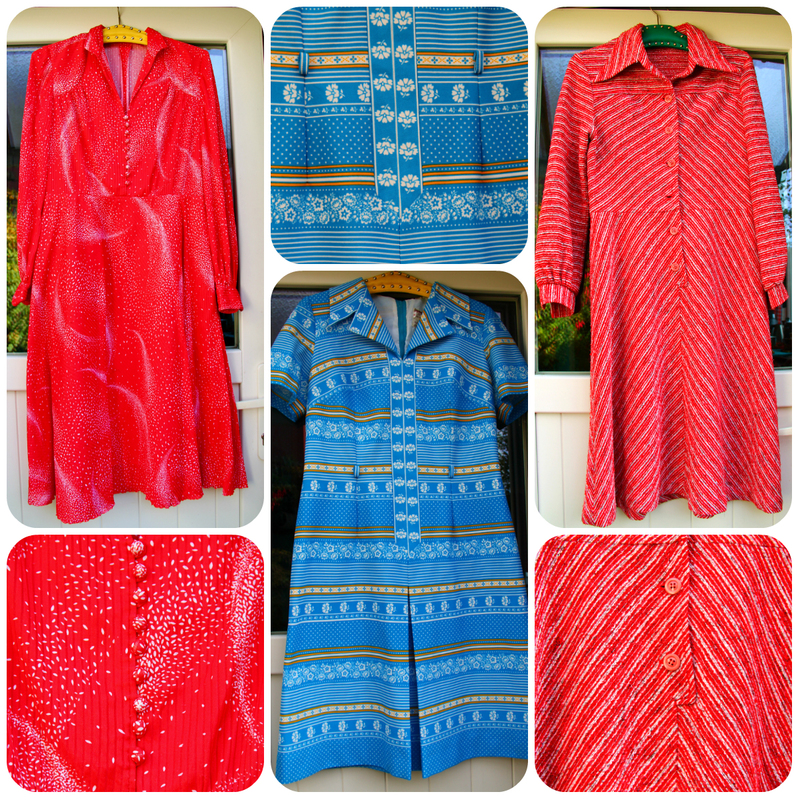 More frocks at another shop.These are all vintage and while the two long-sleeved red frocks can be expected to make an appearance on the blog this season, the blue and yellow one in the centre, a deadstock Diolen, will grace my Summer wardrobe next year. 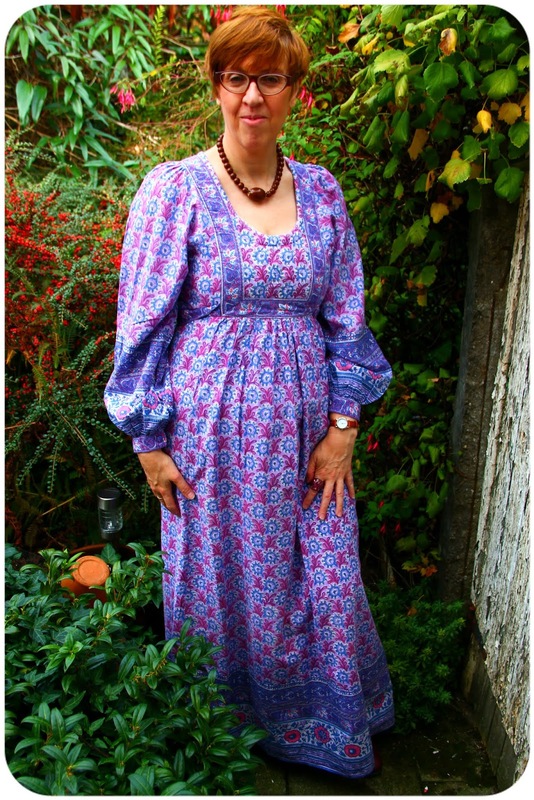 Last but not least is this Indian cotton maxi dress, which I couldn't wait to model for you. It's got a quilted bodice, so no chance of catching a chest cold, I guess! It's also got the most massive sleeves. The things I could smuggle in them! 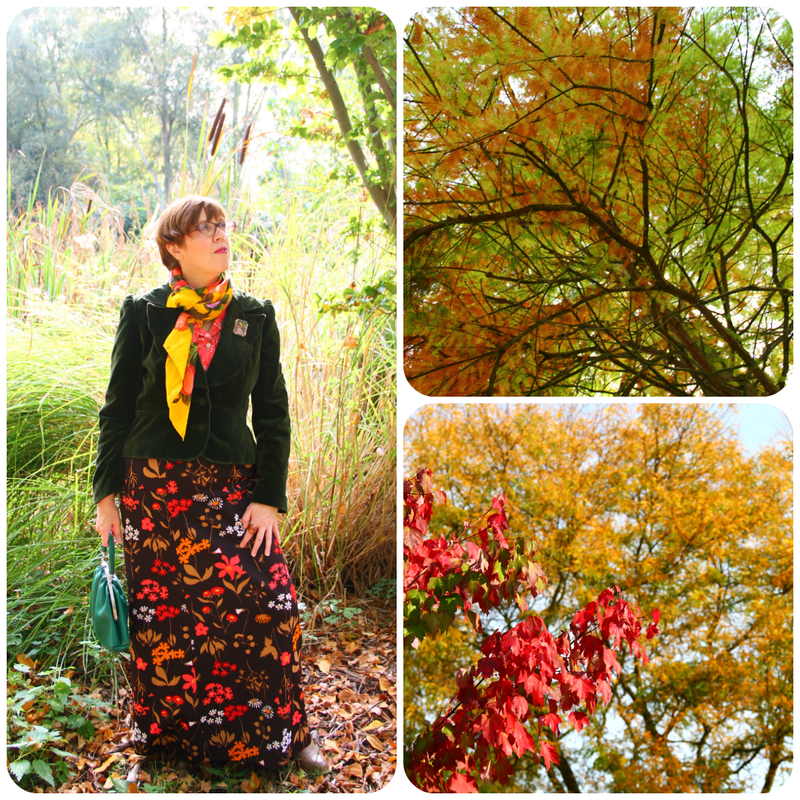 I'm taking my Autumnal outfit to Nancy's Fancy Friday (yes, I know it's Saturday already!) at Nancy's Fashion Style this week. 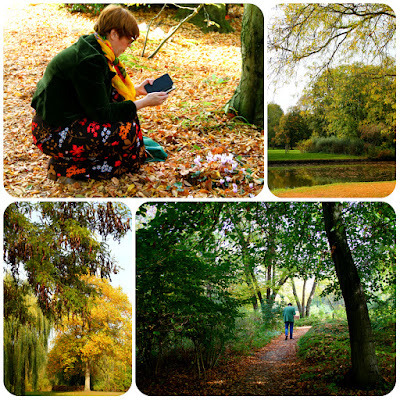 you in the park look like the covergirl of the autumn issue from a posh fashion mag! 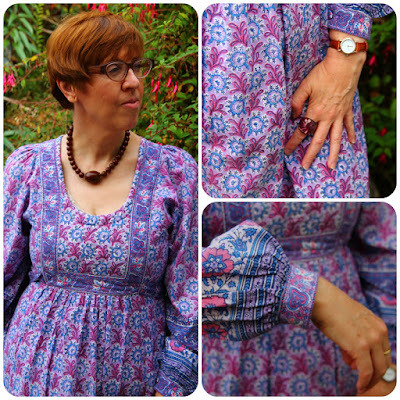 a 70s one of cause :-D fabulous ensemble!! again i envy the boots you find at the 2.hand shop - so chic and pristine. and the indian dress is a dream! 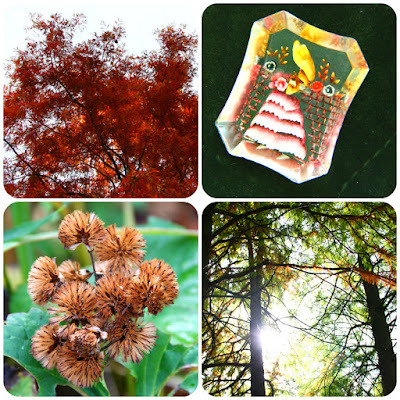 Thank you for this nice autumn pictures. We have still warm days here. I can never understand brand new boots winding up at thrift shops. I guess people like to throw away money. Good for you and me I suppose. You took some wonderful photos here again. It really is a beautiful time of the year. That first outfit looks like it came right out of my wardrobe ; P Great colours! The quilted Indian maxi dress is so unusual. 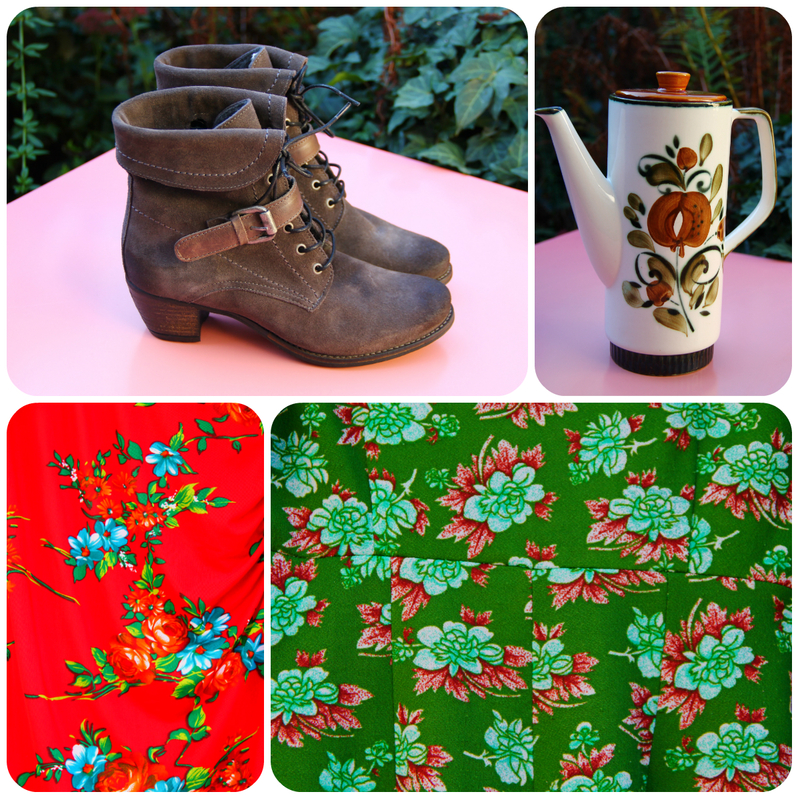 All of these one-of-a-kind details make me fall in love with vintage over and over again. Oh, those sleeves!! I love that last dress, Ann, and also the King Louie one. 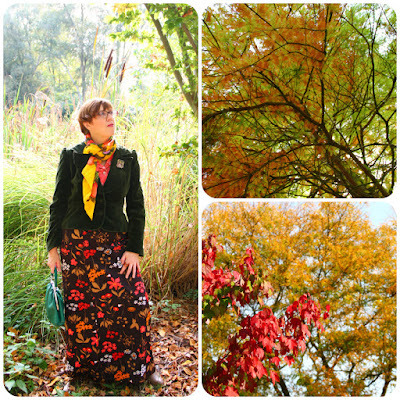 Your park-wandering outfit just sings "Autumn!" - just lovely. Happy week! Your coffee pot reminded me of one I had stashed away in a cabinet with matching cups. Thought it might be the same but mine is Woods. Must have been a popular style. Anyway, thank you for reminding me I have it. I will be putting it to use this week. The green blazer with that amazing maxi skirt is probably my favourite of al your outfits to date. It is just so beautiful. You're dead right, that first outfit is the epitome of Autumn, those rich colours echo the glorious landscape. Your two latest midis are so you, you certainly do well finding those posh King Louis labels, don't you? Loving the Hush Puppies, too - you'll be living in those, I know I would! Didn't you do well in the sale? Lovely frocks as always and I absolutely love your Indian maxi dress. 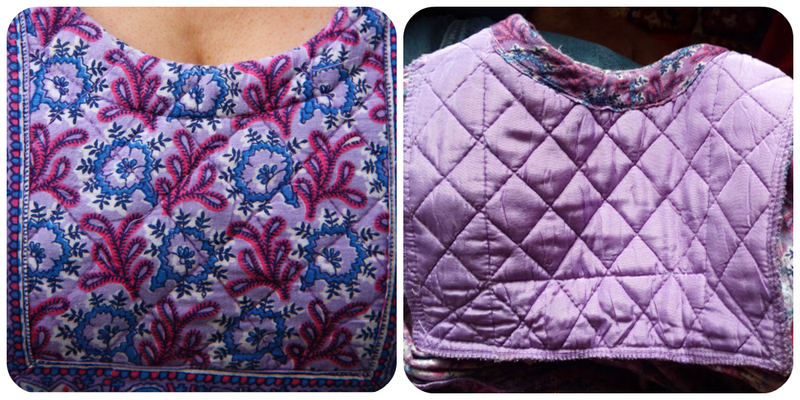 No need for a vest or camisole with a padded/quilted bodice! Hope your weather isn't too wintery at the moment. Ours has warmed up again! All of your looks are so perfect for the warmer autumn days. My favorite one is the first dress. I really like the skirt and the strong and eyecatchy colors. That crinoline lady brooch is indeed a beaut. Love your 'autumnal shades' outfit, and you look absolutely gorgeous wearing it in the golden autumn light, so appropriate. 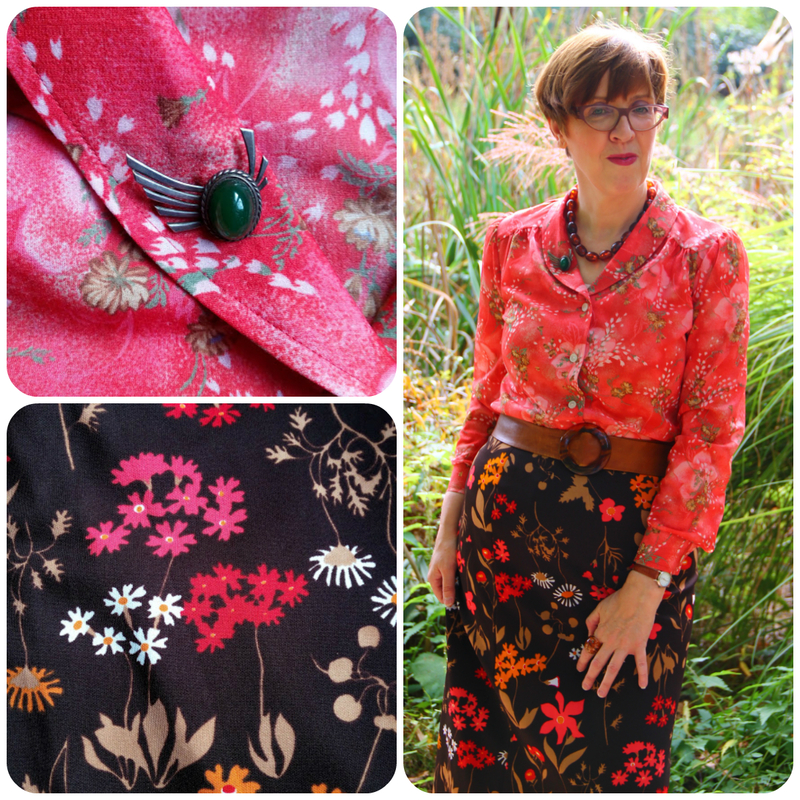 Lovely color combo, lovely printed skirt, lovely jacket (mmmm, velvet!) 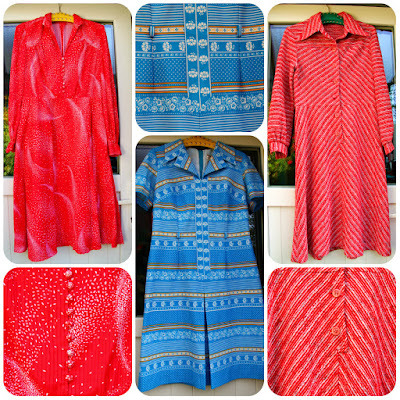 and also lovely cute blouse! 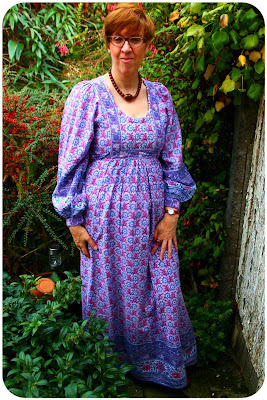 That maxi dress is fantastic!, the color, the print, the sleeves! everything is stunning!. And the quality details always amaze me! so lovely!. You look adorable! 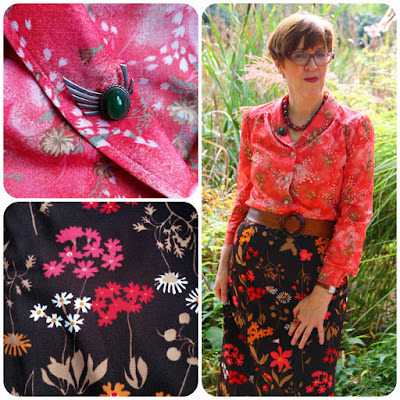 Ann, your outfit with this gorgeous autumnal skirt and green jacket absolutely stole my heart! I would love to repost it in my Fb if you don't mind, with the link to your site, of course. 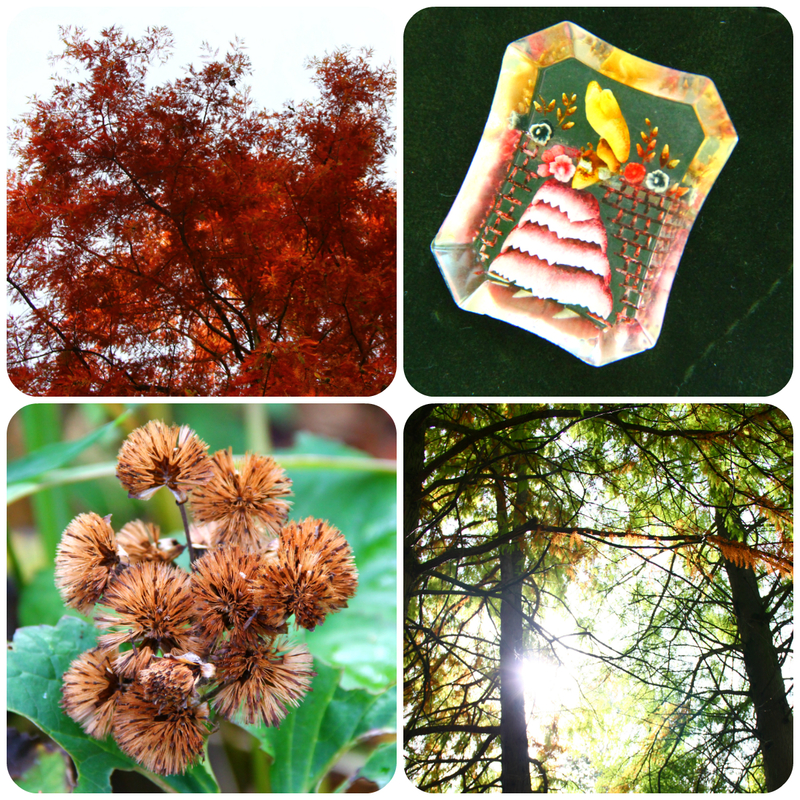 Autumn is finally here. Summer did linger, not that I'm complaining! 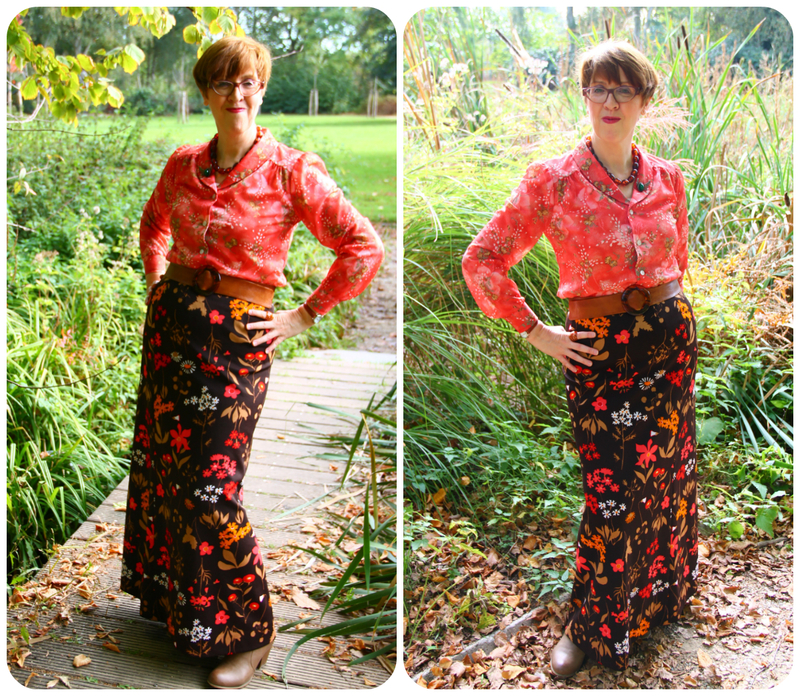 The first outfit couldn't be more autumnal, what a fabulous print on that maxi skirt. You found some lovely things. I knew Vix would love your Indian print dress!